Fences are not only a necessity but add visual dimension to whatever area they are enclosing. Because fences are all over the place and are generally not too exciting they are often overlooked. Fences have grown over time from simple mud walls to high tech metal configurations. One thing is for sure, fences are used by people across cultures and for the same purposes…enclosing livestock, privacy, property designation, noise reduction, and deterring unwanted visitors. In this blog, we will highlight some of the most famous fences around the world. We thought it would be fun to take a look at some fences that are a outside of the norm and a little exciting. The following fences are among the most famous in the world. The Fence At Buckingham Palace: The majestic cast iron fence that encloses Buckingham Palace if one of the most visited in the world. The tall protective stakes are adorned with fleurs-de-lis. Its main purpose is to keep the royal family safe. Despite the fact that the fence is sturdy and quite tall some people have managed to make it past. Dingo Fence: At this time Dingo Fence is truly the longest running fence on Earth. It runs approximately 3400 miles. It was built in the 1880’s out of posts and wire for the sole purpose of protecting livestock from dingos in Australia. Dingo fence has actually become infamous because although it held up to its original purpose, the removal of the canines caused an influx in the kangaroo population. Kangaroos directly compete with sheep for grazing space which has become a huge problem. And kangaroos can actually be more of a nuisance than the dogs. The Aquarium Fence in Turkey: A wealthy businessman in Turkey tore down 164 meters of plain steel fence around his villa and had a glass fence full of fish, eels, and octopus built. Not only is it one of the businessman’s favorite possessions it has become quite the viewing spectacle in the town. Thousands of people a day visit the aquarium fence to see the Aegean sea creatures. Lock Fence: Nestled in the heart of Paris the metal fence that crosses over the Seine River has been covered in padlocks. 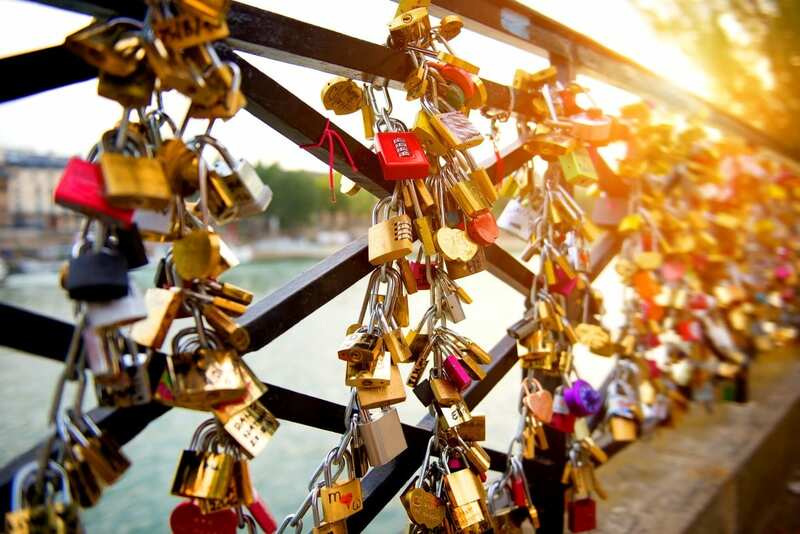 Lover’s started putting padlocks on the fence and throwing the key into the river to forever solidify their love. Unfortunately, in 2015 the locks had to be removed as the weight was causing the fence to collapse. Ballpark Fences: Some of the most iconic fences around today are those that still stand in ballparks. Which fence is the most exceptional is constantly under debate among baseball fanatics. Mysterious Bra Fence: In 1998 this questionable fence began to transform. Located in New Zealand this ordinary wire fence started to be adorned with bras by random passers-by. Fences decorated with odd items have shown up over time but this one is obviously controversial. There appears to be no meaning why people hanging their bras on the fence, but it continues to happen. We are sure there are more of these oddities around and certainly more to come. It is quite interesting how something as ordinary as a fence can become so well known and be a tourist destination. Though we may not be able to help supply you with an aquarium fence, we are experts in fencing! Whether you are looking for privacy, split rail, ranch rail, post and dowel or something else, get in touch with us! We would love you provide you with the wholesale pricing you’re looking for on your next fencing project!